Hi Linda..thanks for stopping at my blog. We do have lots in common...also just starting our blogs too! You look like you have alot more experience with quilting...just love your quilts..beautiful fabrics. I also have done rug hooking...I like that too..took a weekend retreat to learn several years ago. Still working on that one..it's pretty big!! This quilt is exquisite! 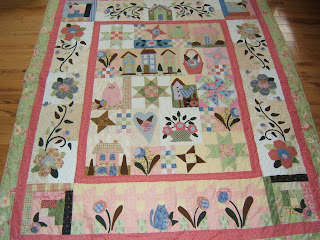 Love your new blog and all the beautiful quilts! It's so nice to hear from you and be invited here! This is a beautiful quilt, love your choices of colours!